Previous PostAre 1-bit ADCs Sufficient?Next PostAre There Any Massive MIMO Books? I note that optimum, sometimes, is to serve up to K = 70 users with M = 200 base station antennas. It is thus not necessarily true that M ≫ K, i.e. there is not always an order of magnitude more antennas than users in massive MIMO. You are absolutely right! To maximize the sum spectral efficiency it is often preferable to serve relatively many users, with M/K<10. Even if the spectral efficiency per user is not extraordinary, the sum spectral efficiency can be huge. However, if we want to achieve high spectral efficiency per user, at the cost of lower sum spectral efficiency, we might want to have M/K>10. I guess, all mentioned numbers correspond to quasi-static channel conditions (or instant ideal CSI), right? Because channel dynamics brings more and more degradation of SE if many layers are used. Actually, it could be interesting to discuss the same issues for moving users with Doppler spread 10-20 Hz at least. In the numerical analysis, we consider Rayleigh fading channels that are static within a coherence block, and independent between blocks. The channel variability is thus captured by the size of the coherence blocks. As you say, more channel dynamics lead to smaller blocks, which in turn give smaller SE. For any given scenario (carrier frequency, Doppler spread, etc. ), you can compute an approximate coherence time and coherence bandwidth, multiply them together and then you have the number of channel uses per coherence block. Importantly: The Massive MIMO analysis does *not* rely on “ideal CSI” assumptions. Channels are estimated, once per coherence interval, from uplink pilots – and the resulting channel estimation errors (and the pilot overhead) are accounted for in the performance bounds. Most of the research works consider linear techniques such as ZF, P-ZF, MRC and MMSE to improve the spectral efficiency, where SE is mostly related to SINR and rate. Is there any other techniques to increase SE? Next question is whether DL achievable SE is higher or UL achievable SE? Regarding uplink versus downlink, there is not absolute answer to that question, because there can be substantial transmit power difference between the uplink and downlink. Traditionally, the downlink uses higher power and thereby achieves higher SE. If the total transmit power is the same, then the uplink SE can be larger since the base station has direct access to the channel estimates and can thus decode the signals more accurately. Thank you Emil Björnson for your sparing your valuable time. I also wonder how to optimize SE and EE in massive MIMO, what is the trade-off between them? 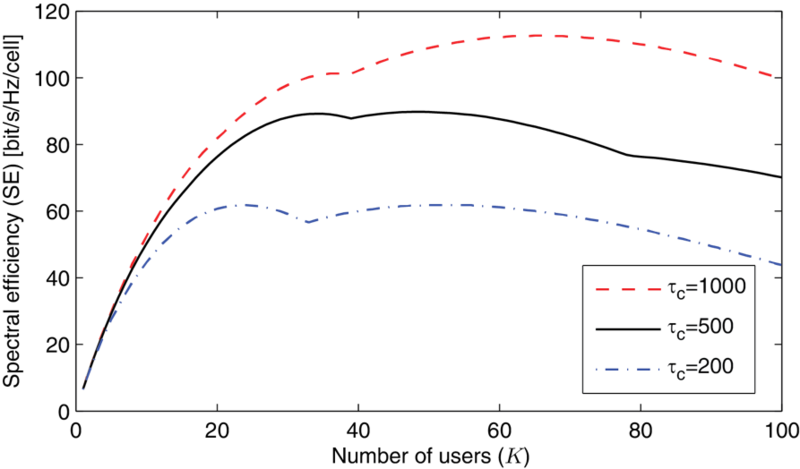 Most papers considered the impact of interference when evaluating the SE. The good news is that Massive MIMO can achieve both high SE and EE, since both of these goals are achieved by multiplexing of many UEs, which share the energy costs and achieve a high sum SE. I believe that this is a topic we will return to on the blog. Sir, can we have the expression for spectral efficiency of massive MIMO? There are many different expressions for the computing spectral efficiency in Massive MIMO, depending on if it is uplink or downlink, or which processing scheme that is used. Hi – great website BTW, very helpful. Sorry for being two months late to this thread, hopefully still open for questions… I’m debating this subject with colleagues, some of whom expect the overall spectral efficiency of a c-band mMIMO sector to be in the 3-6 bps/Hz range, which seems a very long way below what I’m hearing from vendors (and of course the Bristol results). They claim this is due to “real world” adjustments to expected performance, but that seems like a big adjustment. Can such conflicting levels of SE performance be explained? Perhaps currently available mMIMO equipment doesn’t implement digital beamforming, and hence no effective MU capability? What is the expectation of equipment evolution with respect to support for more effective spatial multiplexing – over the next 5 yeats for instance? 3-6 bps/Hz is what you can achieve for single-user transmission under good conditions. Uncoded 64-QAM transmission gives 6 bps/Hz. Hence, I think your colleagues are having single-user transmission with massive beamforming in mind. By spatially multiplexing, say, 8 users the overall spectral efficiency will rather be in the range of 24-48 bps/Hz.